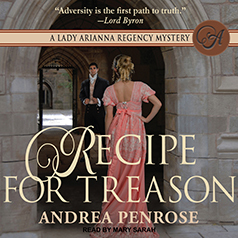 Andrea Penrose presents the third book in the Lady Arianna Hadley Mystery series. A diabolical traitor who's always out of reach . . .
England, 1814. Lady Arianna Hadley and her husband, the Earl of Saybrook, want nothing more than to savor a quiet life embellished by the occasional cup of the finest chocolate. However, when they receive orders to travel to Scotland and capture an elusive traitor, they feel their duty to the Crown must come first. In a laboratory in Scotland, they discover the corpse of a chemistry professor—and cryptic papers hinting at a dangerous new discovery now in enemy hands. Racing against time, Arianna and Saybrook pursue their most cunning and dangerous adversary yet through a complex network of intrigue involving exotic chocolates, daredevil aviators, a missing inventor, and a secret recipe that must be recovered at any cost . . .